The Arcus Cooling Pillow is softer on one side, firmer on the other, & cool all over. A best-of-both-worlds, this pillow is filled with BOUNCE & TEMPTEC™ Technology. Ergonomically designed to cradle and support, it fits snugly under your neck for extra-tailored support. Cooler than the other side of your current pillow. The Arcus Cooling Pillow is softer on one side, firmer on the other, & cool all over. 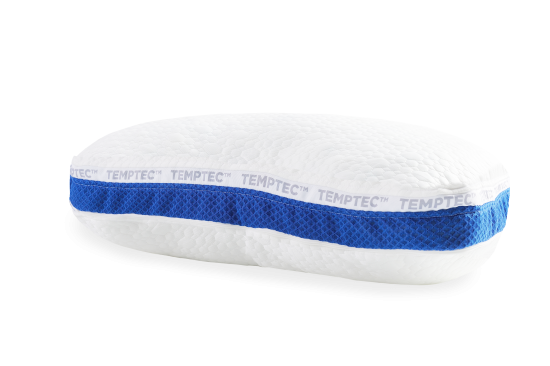 A best-of-both-worlds, this pillow is filled with BOUNCE & TEMPTEC™ Technology. Ergonomically designed to cradle and support, it fits snugly under your neck for extra-tailored support. Plush BOUNCE – Pieces of shredded BOUNCE technology offer pain-relief providing soft yet supportive comfort. Comfort Curve – Curved to conform to the contours of your neck and shoulder. TruGel® Beads – TruGel® absorbs heat and provides maximum cooling allowing your body to transition into a better night’s sleep. Antimicrobial Memory Foam – Memory foam is naturally resistant to allergens, filters out harmful elements and controls odor, fighting mold and mildew.